Students arrive at Dalhousie seeking a quality education that ranks among the best in the country, working alongside world-leading researchers in a wide variety of fields. Maintaining that excellence year after year takes a lot of hard work and planning on the part of the university and its faculty and staff. It also comes with a price tag: salaries and benefits for faculty and staff, financial aid for students in need, crucial upgrades to aging infrastructure and much, much more. Every year, Dalhousie’s Budget Advisory Committee (BAC) seeks the input of students, staff and faculty across the university in developing recommendations for the annual operating budget, which funds these costs and investments. The report was followed this week by two open forums, which provided an opportunity for community members to share their views on the upcoming budget. Here’s our snapshot of some of the issues and factors highlighted in the context report that will influence the 2019-20 Operating Budget. More than 90% of Dal’s operating funds come from just two sources: the provincial operating grant and tuition. The grant is the larger of the two, accounting for just over half of the university’s operating revenue. The remaining 10% or so of the budget’s revenue comes from other sources such as investment income on endowments. The vast majority of Dal’s operating budget — nearly 74% — pays salaries and benefits for faculty and staff, allowing the university to function smoothly and offer its classes and programs. The rest funds things like scholarships and bursaries for students, upgrades to aging facilities and university IT infrastructure, utilities (energy costs, water, etc. ), and funding for key university priorities — all essential for the university’s tri-fold mission of teaching & learning, research, service. The fundamental budget reality Dal has to address is that there’s more money that needs to be spent than there is new money coming in. Why? Like the bulk of the budget, it’s mostly about salaries and benefits for faculty and staff. Dal aims to offer competitive salaries and benefits that attract and retain quality people, and this means Dal’s collective agreements include annual increases to salaries, wages and benefits. Then there are also variable utility costs (which are impacted by external pricing), library acquisitions (affected by inflation and exchange rates) and the need to invest in new technology and maintain aging facilities. Put it all together and Dal operating costs typically increase by 3-4% more each year. 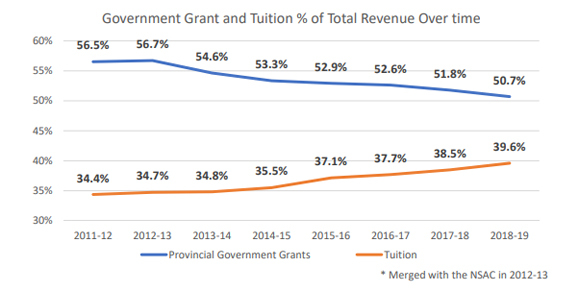 In contrast, under the current agreement with the provincial government, Dal’s government operating grant (representing more than half of the budget) only goes up by 1%. That’s not enough to cover those rising costs — which brings us to tuition. Seven years ago, tuition paid for 34.4% of Dal’s operating expenses. Today, that proportion is up to nearly 40%. Part of this is because Dal’s enrolment has grown: there are 1,400+ more students paying tuition. Additionally, much of that increase is in international enrolment, and international students at Dal — like at all universities in Canada — pay a higher fee. But the main driver of this change is that since 2010-11 government funding has declined by $10 million, due initially to cuts from 2011-12 to 2013-14 and then limited fund increases of only 1% annually since. When considered alongside Dal’s enrolment growth, the university’s average per-student funding has decreased by $1,500 since 2010-11 (before inflation). Without increases in tuition, the university would not have been able to cover the increasing costs of running the university, be they faculty and staff salaries, key infrastructure improvements and strategic investments in its academic and research mission. Alongside these tuition increases, the university has also reduced costs by asking faculties and service units to reduce their budgets by a set percentage. Last year, this cut was 1.5%. What will the budget look like in 2019-20? Put this all together and there’s not a lot of wiggle room in Dal’s budget. It’s constrained by salary increases that are already set, government grants that are limited, and tuition fees that are capped in most respects. But there are still key choices to be made. Where should Dal’s limited-but-vital strategic priority funds be invested? How much can/should the university invest in scholarships, bursaries and financial aids (especially in light of rising tuition)? Are there other opportunities to find cost savings to balance the budget? These are some of the questions the Budget Advisory Committee wants to hear from you about. Visit dal.ca/budget, and you can also submit written comments and input via the current survey or at any time by email at BAC@Dal.ca.